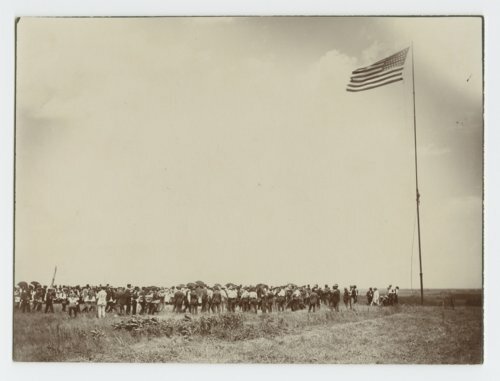 A photograph showing the placing of a marker on a hill at the Pawnee Village site in Republic County, Kansas. This area would become the Pawnee Indian Museum, the oldest historic site owned by the state of Kansas. In 1899 George and Elizabeth Johnson deeded to the state of Kansas most of the site upon which a large Kitkehahki (Republican) band Pawnee earth lodge village had stood in the late 1700's. The state accepted the site in 1901, put up an iron fence and erected a granite obelisk to mark the site where in 1806, United States explorer Zebulon Pike convinced the Pawnees to lower the Spanish flag, recently left there by a large Spanish force and raise the United States flag. Supposedly this was the first time the U.S. flag was raised west of the Missouri River. This flag raising episode was true except it happened about 40 miles up the Republican River at a village the Pawnees moved to after deserting this one. The portion of this site that was saved included 22 earth lodge depressions, numerous storage pit depressions, and remains of the fortification wall. Two house depressions were excavated in 1949 but intensive investigation of the site did not occur until 1965 under the direction of Kansas State Archeologist Tom Witty. In 1967 the museum was constructed around one of the largest of the lodge depressions before it was excavated. What the residents of the lodge left behind was uncovered by the archeologists and left in the exact same spots. Only eight of the 22 lodge depressions have been excavated. The site was listed in the National Register of Historic Places in 1971. Today the site is operated by the Kansas Historical Society as Pawnee Indian Museum State Historic Site. A photograph showing the placing of a marker on a hill at the Pawnee Village site in Republic County, Kansas. This area would become the Pawnee Indian Museum, the oldest historic site owned by the state of Kansas. In 1899 George and Elizabeth Johnson deeded to the state of Kansas most of the site upon which a large Kitkehahki (Republican) band Pawnee earth lodge village had stood in the late 1700's. The portion of this site that was saved included 22 earth lodge depressions, numerous storage pit depressions, and remains of the fortification wall. Two house depressions were excavated in 1949 but intensive investigation of the site did not occur until 1965 under the direction of Kansas State Archeologist Tom Witty. In 1967 the museum was constructed around one of the largest of the lodge depressions before it was excavated. What the residents of the lodge left behind was uncovered by the archeologists and left in the exact same spots. Only eight of the 22 lodge depressions have been excavated. The site was listed in the National Register of Historic Places in 1971. Today the site is operated by the Kansas Historical Society as Pawnee Indian Museum State Historic Site.